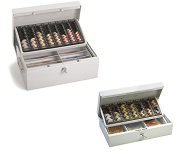 INKiESS PREMiUM counting cash boxes coin insert will slide back while opening the box releasing banknote compartments. 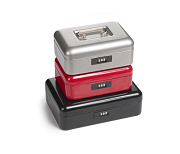 PREMiUM counting cash boxes are made of exceeding solid sheet steel with shockproof powder coating. Double lock bar (703 ST with door latch) and cylinder locks with 2 keys. 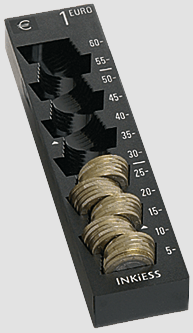 The inexpensive alternatives are featuring the same advantages as a coin counting cash box. In steel cash boxes PERFECT and PROTECT the coin insert will slide back while opening the box releasing the banknote compartments. Shockproof powder coating, cylinder locks with 2 keys.